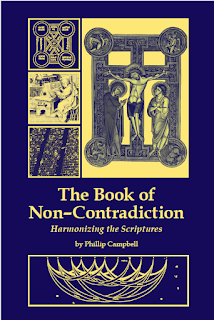 Back in February, our modest publishing outfit Cruahcan Hill Press released a book entitled The Book of Non-Contradiction: Harmonizing the Scriptures by Phillip Campbell (erm, me). This book was written to confute the ubiquitous assumption of modernity that the Bible is a book full of contradictions. We would expect such a faith-destroying proposition from seculars, but since the 19th century, this thesis has found its way into Christian pulpits as well thanks to the school of "Higher Criticism." It is no secret that the Bible contains difficult passages. Any Christian who has ever seriously read the Scriptures knows there are parts that are hard to understand, or that it is hard to see how they fit in context with the rest of the Bible. Biblical exegesis from antiquity to the 19th century, motivated by a spirit of faith, generally sought to reconcile these discordant passages, focusing on how the verses illustrate different theological truths. The golden thread that wound the Scriptures together was the totality of God's revelation, which was able to harmonize the entirety of the Bible. Different books, stories, and passages - even those which looked radically different - were no more fundamentally contradictory than different colored pieces of glass making up a single stained glass image. This beautiful harmonization was made possible because of the spirit of faith. It should be mentioned, this thinking was common to both Protestant and Catholic scholars. Though obviously Protestant thinkers took certain biblical passages in a different light than Catholic tradition, they still assumed the harmony of the Scriptures. That is, even if Protestants posited a radical rupture with Catholic tradition, they at least assumed the Scriptures were consistent with themselves. But beginning in the late 19th century, the school of "Higher Criticism" began to take a different approach. Anti-supernaturalist in its assumptions, the Higher Critics implicitly denied the very idea of a unifying body of divine revelation. The golden thread was cut. Instead of working to show how various passages were unified, the new critics focused on the differences among them, even positing that they were in plain contradiction. This view has found its way into seminaries and pulpits around the world. It is an errant and faith destroying proposition that leads to a loss of faith in the veracity of the Scriptures and a relativizing of Divine Revelation itself. The Book of Non-Contradiction: Harmonizing the Scriptures attempts to fill this void by looking at several of the "problematic" passages of the Old and New Testaments and explaining their theological unity in light of the fullness of God's revelation, and demonstrating that there really are no contradictions in the Bible. Even previously published essays have been reworked and added to, and everything has been orchestrated in chronological order. The result is an easily readable, faith-building book that really digs into the Scriptural texts and applies classic principles from our Catholic theological tradition to demonstrate the beautiful unity of the Scriptures. "This is a book that needs to be written anew for every generation. Eusebius wrote one in the third century, and he was already drawing from more ancient sources. The enemies of Christianity always grasp at the same rhetorical straws, and it’s our duty to be ready with the best response. Phillip Campbell makes that easy for Catholics today." I also want to point out that, while this book is obviously written from a Catholic perspective and draws heavily on Catholic theological sources (such as the Catechism, Aquinas, and Leo XIII), it would also be very edifying to any Protestant or Orthodox who takes the Bible seriously. 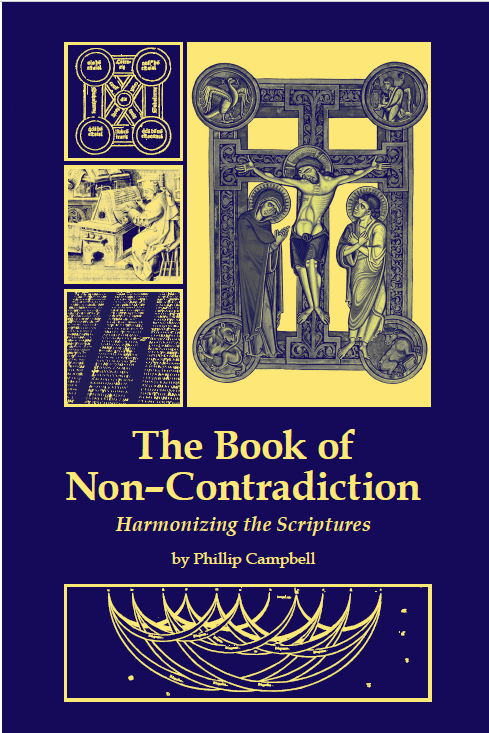 The Book of Non-Contradiction is 202 pages, $17.99 + shipping. Available at Cruachan Hill Press but also on Amazon; however, for readers of this blog, I have set up a special Paypal link below for you to get the book at the discounted price of $16.50. Woo hoo! Ordered. Can't wait to get my copy.